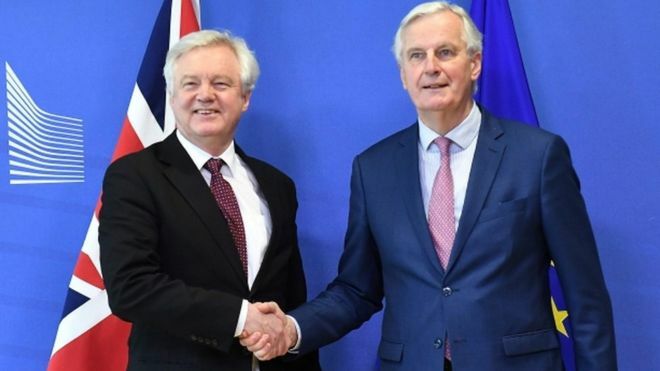 David Davis is meeting the EU's chief negotiator Michel Barnier in Brussels ahead of a crunch meeting of European Union leaders later this week. The Brexit secretary hopes to finalise details of transition arrangements that would come into force when Britain leaves the trading bloc in March 2019. The EU wants this period - smoothing the way to the new permanent relations - to last until 31 December 2020. Both sides hope an agreement can be signed off at the EU summit this week. Theresa May, who is going to that summit on Thursday, has said the transition period should last "around two years" but Mr Davis said last week he could "live with" a shorter one if it helped secure a deal.